The Buckeye Trail runs right through Hocking Hills State Park. Most folks are familiar with it as it runs through Old Man’s Cave to Cedar Falls, and then down to Ash Cave. 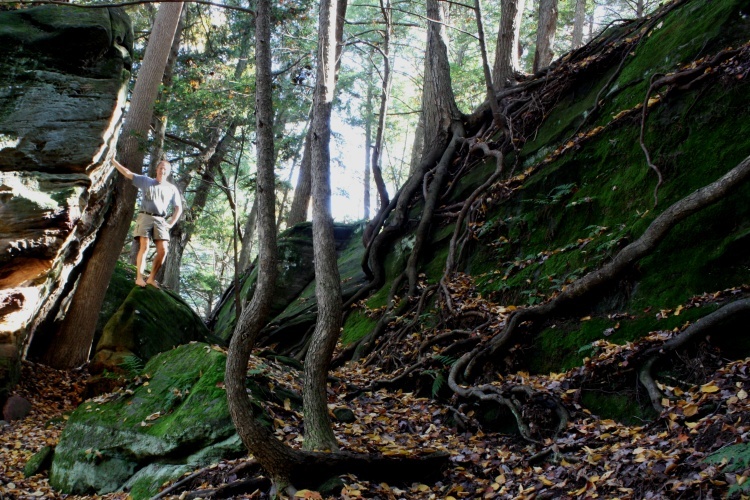 But it also heads north from Old Man’s Cave to the Rappelling and Rock-climbing area of the State Forest. I have hiked it only rarely, mainly because a lot of it was on a gravel road. But last week I hiked it again just for the heck of it and discovered that they’d rerouted it. And they’d done a nice job of it, too. I parked at and started at the Rappelling and Rock-climbing area. I’ve rappelled there before, but I’m not really a rock-climber. 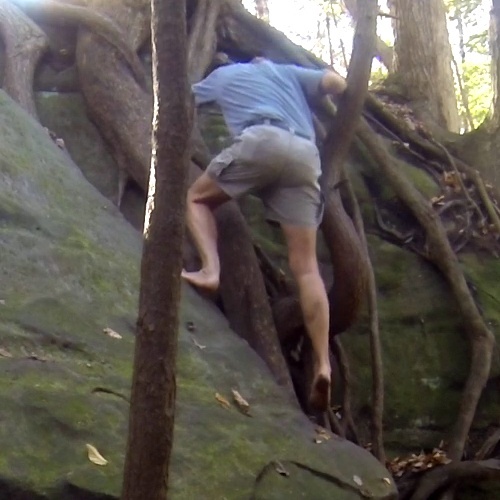 However, that doesn’t mean I can’t do a bit of rock-scrambling as part of a hike. Let’s start with some video approaching a small 20-foot cliff that has a few spots that one can scramble up at. That’s really fun, and doing it barefoot adds to the pleasure. After that shoot, I had to head back down to get the camera, so I continued below the top for a little bit more. Farther along the cliff wall is a slump rock sitting next to another scramble spot. Good spot for a picture. From there (let’s go to the video!) I headed up that slopey part (the Buckeye Trail is right at the top there) and headed towards Old Man’s cave. You’ll get to see exactly what the rerouted trail looks like. It doubles as a horse trail, so it is quite wide. While up there I must have passed a persimmon tree. 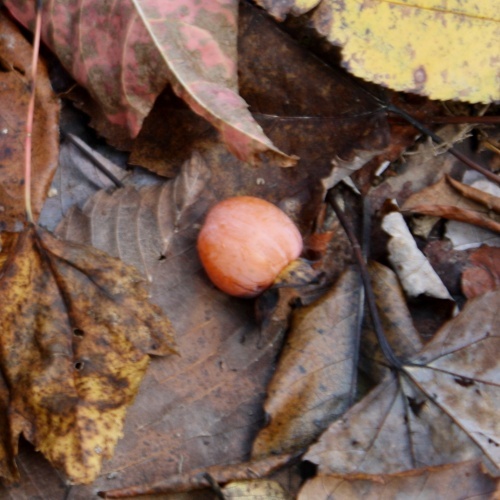 I didn’t manage to identify which tree, but the persimmons on the ground were quite obvious. They were ripe so I ate a few. The one in the picture isn’t quite ripe so I left it. An unripe persimmon is tart enough (and kind of sticky-slimey) that it’ll really pucker your lips. But the ones I had were just right and delicious. Another change since the last time I hiked this was this sign. Yes, they’d logged an area that the trail went through. 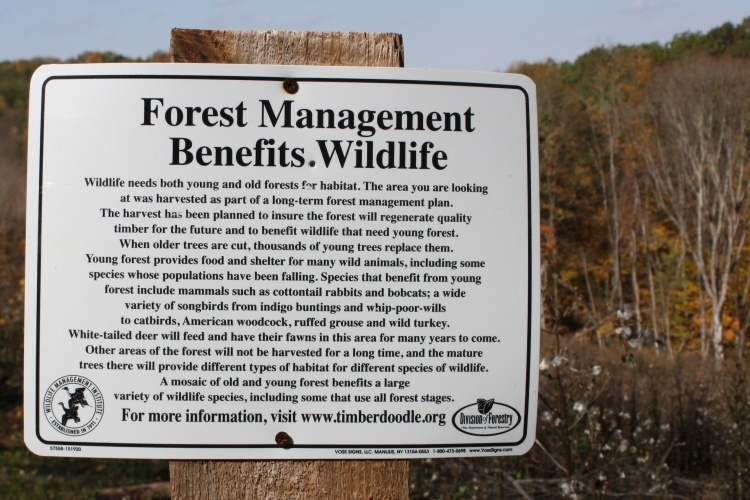 They claim that this is necessary for a health forest, but the forests were perfectly healthy on their own long before we got there. 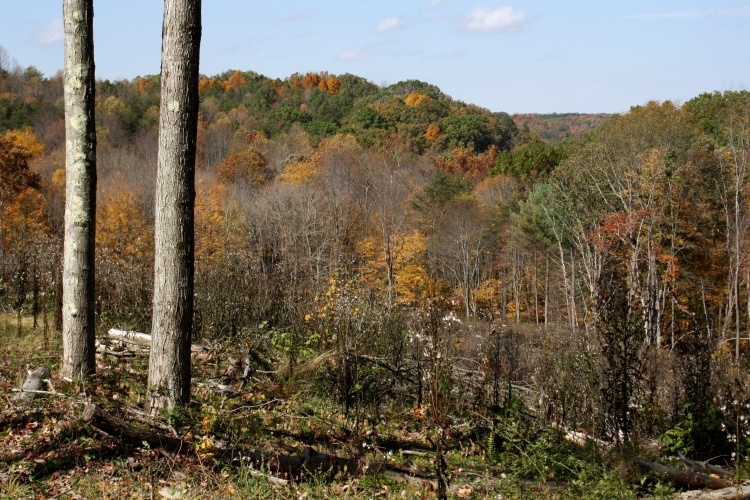 Native Americans managed the forests to keep up game, but from my understanding they used fire to do so, which cleared out underbrush (and put nutrients back into the soil) and increased habitat. This clear-cutting just looked like crap. I have to admit, though, that it did provide a nice view of the countryside. Hiking the rerouted trail gave me a chance to update my hiking maps for the area. 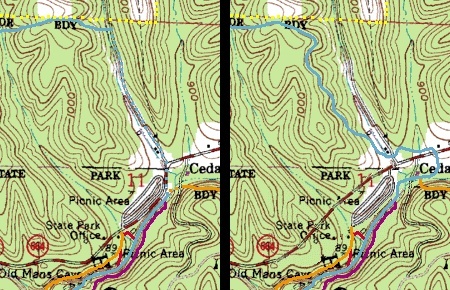 On my regular website, I have topographic maps of a lot of hiking places in southeast Ohio, here. I of course include Hocking Hills. Here’s a side-by-side comparison of the change (the Buckeye Trail is in slate-blue, just as the blazes are). This shows the area where I shot the video. You can see not only how the trail was rerouted (much improved), but you can also see how the road just north of Old Man’s Cave was recently rerouted too. This was a multi-million dollar project to make things safer there—with all the foot traffic the old way of having people have to cross the road from the parking lot to the cave was just asking for trouble (and regularly got it). You saw how I was dressed. It was a good 65° (18C), and shorts (and bare feet!) are plenty warm for hiking in that weather. Well, at Old Man’s Cave, a lot of folks didn’t figure that out. In this video, I head from Old Man’s Cave down to the lower falls, and you can see how people are dressed—some had on heavy jackets and hats! The video continues with me back at the Rock-Climbing area on the Buckeye Trail above the cliff, and ends with me scrambling back down the way I came up. I really kind of like that last segment since it does a nice job of showing just how great it is to do these sorts of things barefoot. You can feel what you are stepping on. Your toes can help grip the rocks and roots. And of course it feels great doing so. This may well be their actual reason. Never found a better one.